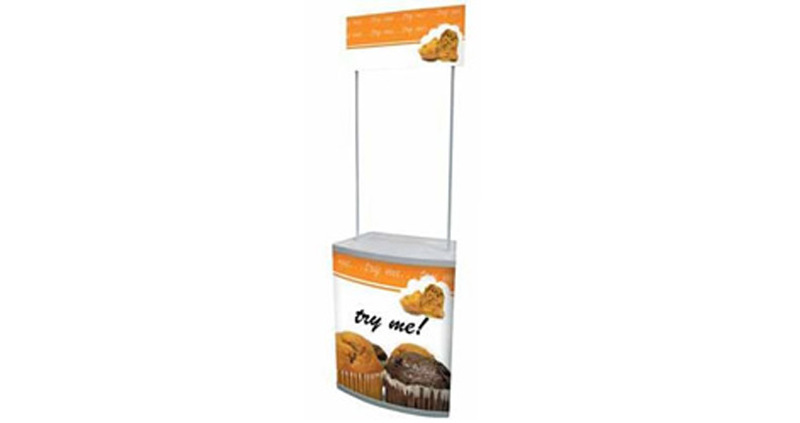 This promotional counter is known for being quick and easy to set up – it should take around three minutes from start to finish. This is perfect for field marketing, as you’re often on your own and only have a limited time to get in and get out. The Ragtime promotional counter base model comes in plain white (no graphics). For maximum impact, however, we recommend customising the counter with printed graphics on the front and header board – please contact us for pricing. To ensure that the counter is protected when not in use and that it can be transported between locations safely, we supply a carry case. The counter folds up to fit comfortably into the case and, as it weighs only 8.7kg, it’s easy to carry. Our Ragtime counter is around 820mm wide x 2120mm high x 410mm deep. It weighs approximately 8.7kg, so is easy to move around. What is the counter made from? The counter is manufactured from rigid PVC, so you can rest assured that it is lightweight but also very sturdy and durable.